Your big day is nearly planned, and now you want to add something extra to the proceedings. Why not a close-up magician? This is the perfect style of entertainment for your magical day, that fits in wherever you need it. While photos are being taken Jay can amaze your guests, keeping them happy and engaged and warmed up for the rest of the night. 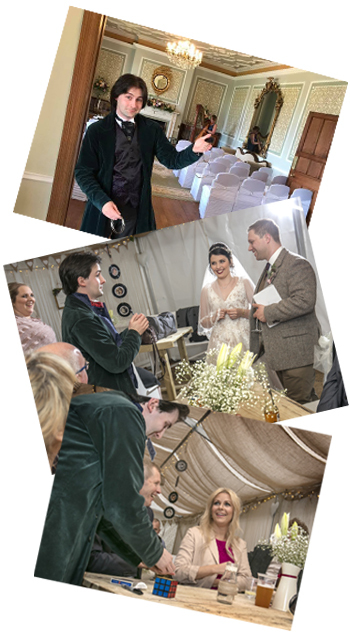 During the wedding breakfast is a great time for walk around close-up magic, not only does it fill the lull between courses, but is the perfect ice breaker for those who may not know each other all that well. It gives everyone something to talk about. The evening reception is also a great time for a touch of magic, adding that extra piece of amazing entertainment to your day. However you’d like to utilise this unique form of performance, then give us a call and we can chat about how best to meet your needs.